Having just survived the overwhelming deluge of Valentines ads in the last week, one truly stood out from all the others in the clutter- not that I am taking advantage of the offer. This ad from Ikea is the clear winner this month. While there might be some takers for their offer, I suspect they are relying on two other things. 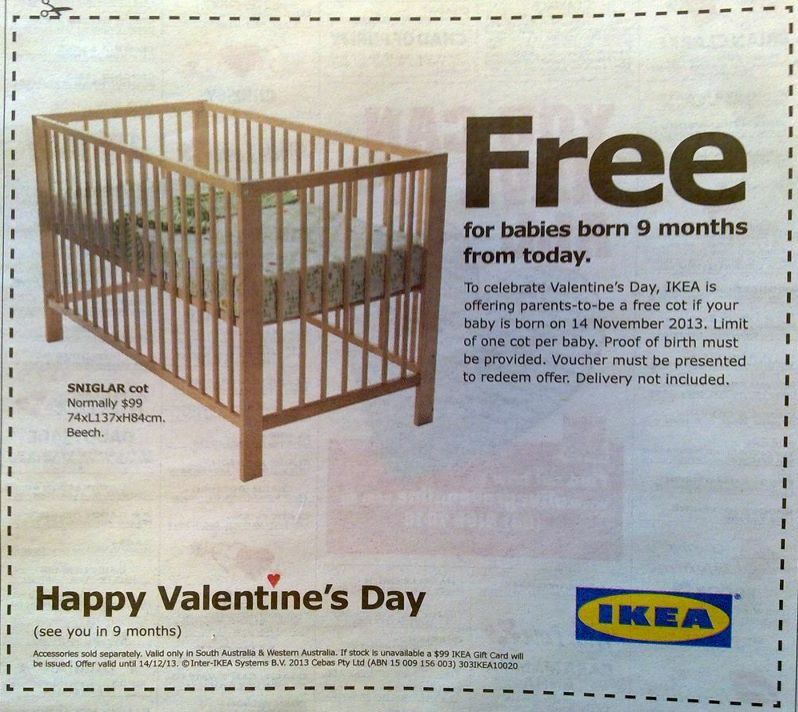 Firstly if a couple does take advantage of the offer, Ikea will be counting on them buying a whole lot of other furniture and accessories for their nursery. Secondly, because the ad is so memorable, it helps Ikea stay top of mind for those couples who haven’t quite got their timing right, and for just about everyone else as well. You will notice in the small print that delivery is not included. That will be the mother’s responsibility!